2008 Anthology of Wavy Rule Cartoons Now For Sale--Cheap! 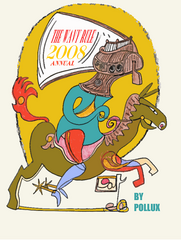 It is with great pleasure that we announce the release of The Wavy Rule Annual: 2008, the entire 2008 collection of cartoons by Pollux in one convenient paperback! As you know, “The Wavy Rule” runs every weekday on Emdashes, touching upon all things New Yorker-y, all things wavy, and all things ruley. We are pleased to offer you the opportunity to get your own copy signed and illustrated by Pollux and shipped right to your door, gate, postern, hatchway, or portal. The anthology includes all the cartoons that ran from June 26, 2008 to December 31, 2008, and includes a foreword by yours truly. Please include your name and return address. Don’t like snail mail? Don’t trust the post office? You can also order online through PayPal. You may make a payment there to emdashes [at] gmail [dot] com.